2013 Nissan Pathfinder Pros and Cons: Why (Not) This Car? Nissan has a tendency to zig when others are zagging. This doesn't always work out well. When everyone else was coming out with car-like three-row crossovers, Nissan opted to pitch families a gas-guzzling, truck-based, body-on-frame Pathfinder. Even with heavy incentives, sales were low. Corporate got the message, and eight years later we have a new, car-like 2013 Pathfinder. Nearly the last major car line to offer a three-row crossover (VW will be last), Nissan could learn from everyone else. One lesson apparently learned, likely from GM's success with its large Lambda crossovers: make it big. Though a few inches less lengthy than a GMC Acadia, the new 197.2-inch Pathfinder is six inches longer than the Honda Pilot and ten inches longer than the Toyota Highlander. Here I pit it against the segment's big boy. Attractively functional. Berber floor mats a nice touch. 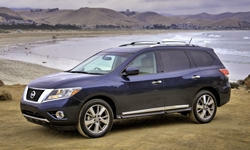 Why the 2013 Nissan Pathfinder? Among those zigs, Nissan placed a big bet on continuously variable transmissions (CVTs). Many people don't like how CVT-based powertrains sound and feel (which is a bit much like a slipping conventional transmission). But CVTs can hold an engine at a set, optimal rpm, either low for economy or high for performance, as the vehicle accelerates. Unlike the related Infiniti JX, the new Nissan Pathfinder gets Nissan's latest CVT, which has a broader range (6.4 vs. 5.4 multiple between the highest and lowest possible ratio) and lower internal friction. So it has even more flexibility to maximize either performance or fuel economy. 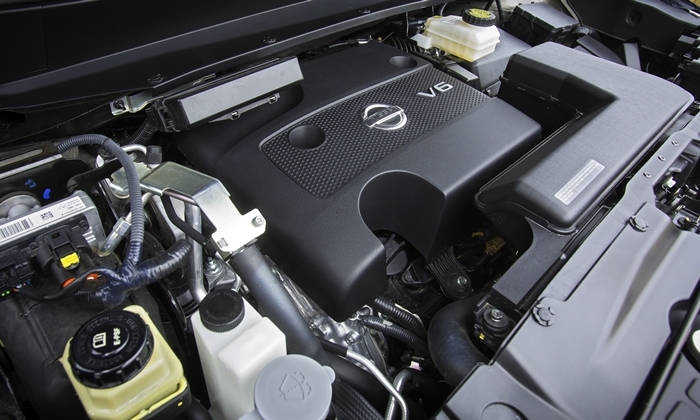 On the performance front, the CVT makes the most of a 3.5-liter V6 that, with 260 horsepower and 240 pound-feet of torque, under-performs the V6s in most competitors. Though a touch slow off the line, the 4,471-pound Pathfinder Platinum feels stronger than the quarter-ton-heavier GMC Acadia, and is generally as quick as anyone needs this sort of vehicle to be. Plant your foot, and it'll get to sixty in about eight seconds. Personally, I don't even mind how Nissan's CVT feels when paired with a V6 (though I do prefer the more direct feel of the CVT in the new Honda Accord). The CVT's real forte, though, is fuel economy. The front-wheel-drive Pathfinder earns EPA ratings of 20 mpg city, 26 mpg highway. The 4WD Pathfinder does only a single mpg worse, 19/25. This is much better than the Acadia's 16/23, and also better than the Ford Explorer's 17/23, Honda Pilot's 17/24, the Toyota Highlander's 17/22, and the related Infiniti JX35's 18/23 (all with AWD). For higher fuel efficiency in a relatively affordable three-row crossover, you'd have to get a Highlander Hybrid (28/28). Or wait until next year, when Nissan will offer a hybrid version of the new Pathfinder (25/27). Unlike with competitors, you can lock the Pathfinder into two-wheel-drive. This might boost fuel efficiency a little. Four-wheel-drive isn't much necessary for dry-road performance or handling--the front tires manage the V6's torque well in all but the most energetic driving. In typical suburban driving after the engine was warmed up, the trip computer reported averages in the low 20s, and as high as 26 when I was especially easy on the gas and had good luck with traffic signals--impressive for a large crossover. A final bonus: unlike with the Infiniti JX, premium fuel isn't recommended. Perhaps because it shares underpinnings with the Infiniti JX, the new Nissan Pathfinder has a solid, premium feel. Noise levels are low, and the suspension absorbs most bumps well even when hobbled by the Platinum's 20-inch wheels. (Lesser trims with 18-inch wheels should ride even more smoothly.) The Acadia Denali is also very quiet inside, and also rides well, though its tighter suspension tuning eliminates the Pathfinder's occasional bobble at the cost of some jitteriness. The Pilot and Highlander, with shorter wheelbases, don't ride as steadily. I haven't driven a Ford Explorer in a while, but if memory serves its ride might feel a little cushier than the Pathfinder's, and it's at least as quiet inside (but hard to see out of thanks to smaller windows and massive pillars). Undulating character line flows into tail lamp. Kinked window outlines work well with it, too. Hard to read controls located low on instrument panel and those for seat heaters when driving. If the Nissan Pathfinder gets better fuel economy than the Infiniti JX and costs much less, while driving much the same, why get the Infiniti? Well, the Infiniti has an upscale badge, one-year-longer warranty, flashier exterior, xenon headlamps, more luxurious wood-trimmed interior, and optional high-tech safety aids (including adaptive cruise, forward collision alert, blind spot monitoring and intervention, lane departure warning and prevention, and backup collision intervention). Some people will want the additional tech, others wouldn't pay a dime to have the car monitor and even correct their driving (though I'd welcome blind spot sensors in the Nissan). The JX's interior differences are mostly aesthetic. Though the Nissan's interior appears more ruggedly functional and less luxurious, it feels nearly as upscale, with large, substantial front seats and wide, amply padded armrests. The Pathfinder's instrument panel is hard to the touch, but how often will you touch it? Compared to the Acadia, the Pathfinder Platinum has some extra features (proximity key, heated steering wheel, heated second-row seats) and lacks others (xenon headlamps, head-up display, power-folding mirrors, power lumbar for the front passenger). One feature the Pathfinder Platinum does share with the JX, and that you won't find on any direct competitor, is an around view monitor. This feature combines images from multiple cameras to provide a top-down view of the entire periphery of the vehicle. This makes parking not only easy, but even fun, like a video game. You can park even a vehicle as large as the Pathfinder perfectly on the first attempt, every time. You don't have to worry how close either end is coming to other cars or objects when maneuvering in tight spaces--you can see how close they are. The only thing I don't like about this system is that it only operates at very low speeds. A view along at least the passenger side of the car at higher speeds, like that offered in the new Honda Accord, would be very helpful in any large crossover. With a list price of $44,395, a loaded 2013 Nissan Pathfinder Platinum 4X4 with Premium Package (conventional sunroof, large glass panel over the rear seats, dual screen entertainment system) is not cheap. In fact, it's about $2,000 more than a comparably equipped Honda Pilot Touring or Toyota Highlander Limited. But adjusting for the Pathfinder's additional features narrows the gap to just $800 and $400, respectively. This seems a reasonable amount given the Pathfinder's larger size and 20-inch wheels (the others have 18s and 19s, respectively). Compare the Pathfinder Platinum to the Acadia Denali, and the Nissan even seems a bargain. While the GMC includes about $2,000 in additional features, it lists for $6,825 more. The Explorer also lists for more--$3,000 extra before adjusting for feature differences (chiefly the controversial MyFord Touch system), $900 extra afterwards. And the related Infiniti JX35? Comparably equipped, it lists for over $8,000 more before adjusting for feature differences, and about $6,600 more afterwards. Perhaps $600 of this can be accounted for by the Infiniti's one-year-longer warranty. The Infiniti does have a nicer interior. But is it $6,000 nicer? Going in the other direction, if you don't mind a narrower interior and significantly less cargo space behind the third row--but more legroom and comfort in the rear seats--the new 2013 Hyundai Santa Fe is the real bargain among three-row crossovers. A Limited with Tech Package lists for $5,365 less before adjusting for feature differences, and about $4,000 less afterwards. Plus the longest warranty in the bunch. Why Not the 2013 Nissan Pathfinder? With three kids, I own a vehicle in this category. One thing I look for is whether I could fit our luggage for a typical trip without folding any seats. The large GM crossovers (24 cubic feet, but no well), Ford Explorer (21 cubic feet, with a deep well), and Honda Pilot (18 cubic feet, with a deep well) make the grade. The others, including the new Pathfinder (16 cubic feet, no well), do not. To take a trip in this vehicle, we'd have to either fold at least one section of the third row or use a rooftop carrier. Fold both rows, and the Nissan's cargo space appears more voluminous than the 80 cube official spec. If the specs accurately reflect real-world capacity, the narrower Hyundai and wider Explorer hold as much, the Pilot (87 cu. ft.) and Highlander (an especially iffy 95 cu. ft.) hold more, and the Acadia (116 cu. ft.) holds far more. Towing, on the other hand, is a thoroughly competitive 5,000 pounds despite the traditional fragility of CVTs. The Acadia is rated to tow a bit more (5,200), the Explorer and the Highlander the same, and the Pilot a bit less (4,500). Notably, the Infiniti JX, with its previous-generation transmission, is only rated to two 3,500 pounds. Adults will easily fit in both back rows if the second row is adjusted midway through its travel, but they won't be very comfortable. Total legroom for all three rows is a generous 114.7 inches, 3.4 more than in the larger GMC Acadia. But as in the Acadia, the second row seat is too low to provide adults with proper thigh support. The Ford Flex is the champ in this area, while the new Santa Fe also puts in a strong showing. The seat cushion itself feels more substantial than that in the Acadia, but the GMC can fit three people in the third row (as can the Pilot). Only two can sit back there in the Pathfinder. Looks capable of pulling a good-sized boat--and is. Enough room, especially if you slide it all the way back, but too low. All controls are within easy reach, and most are easy to operate. But the group of buttons near the driver's left knee is impossible to read while driving, and those for the climate control and seat heating/cooling are nearly as difficult to view at a glance due to their locations. Nissan used to prioritize handling over ride quality when tuning the suspensions of its vehicles. This has changed with the latest batch. Like the new Versa, Sentra, and Altima, the Pathfinder's suspension tuning favors ride quality. The big crossover handles safely and predictably, with good composure and hardly any float or slop in typical driving. But when pushed the Pathfinder feels ponderous, with vague steering as the front tires approach their limits. The GMC, despite being significantly larger and heavier, feels relatively athletic when taking curves quickly. Buyers of large crossovers don't tend to put a high priority on handling, though, and most handle little if any better than the Pathfinder. Though not beautiful, the Nissan Pathfinder has the ruggedly handsome appearance many people desire in a crossover. I personally find the Acadia and Explorer a little more attractive, but the Pilot and Highlander considerably less so. The Infiniti attempts a more flowing, upscale look that to my eye appears overly contrived. I can see how some people might find the Pathfinder the most attractive of the bunch, so I'll call this a draw. Dings for second row comfort and cargo volume suggest that Nissan didn't take full advantage of the 2013 Pathfinder's relatively large exterior. These aren't bad, but given the crossover's 197-inch length should be better. Still, class-leading fuel economy plus a smooth, quiet ride and substantial feel (borrowed from the more expensive Infiniti) easily explain why the new Pathfinder is far outselling the old, truck-based one. The main thing Nissan could have done better: offer this far more competitive Pathfinder back in 2005. Down on power compared to most competitors, but thanks to CVT good performance and great mpg. Not enough space for my family's stuff. Shallow hidden compartment beneath floor. Nissan provided an insured Pathfinder for a week with a tank of gas. Sellers GMC (248-478-8000) in Farmington Hills, MI, provided an Acadia for comparison purposes. 2013 Nissan Pathfinder pros and cons, according to Michael Karesh: the best reasons for buying (or not buying) the 2013 Nissan Pathfinder. Join TrueDelta to post your own impressions.